We are slightly obsessed with the Nutshell Studies of Unexplained Deaths, lilliputian real-crime models an eccentric heiress created for fun in the 1940s. And now John Waters is narrating the movie they deserve! Frances Glessner Lee had a lifelong interest in forensics, but was discouraged from pursuing higher education; it wasn't until after her brothers died that, in her 50s, she pursued her passion. Ultimately, she'd go on to found the Harvard department of legal medicine, the first program in America dedicated to forensic pathology. 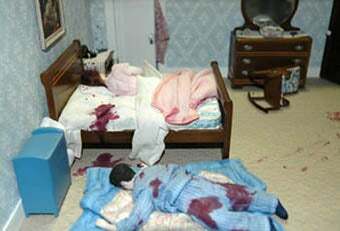 Her scale dioramas — which she displayed at a series of informal seminars to prominent crime scene investigators — were so accurate that they're still used today in forensic seminars. Incidentally, Lee was made an honorary Captain in the New Hampshire State Police. If you can get your hands on a copy of The Nutshell Studies of Unexplained Death book, do it — it headed my Christmas list a few years ago — but in the meantime, mark your calendars for Susan Marks' film! We can't think of a more fitting subject. And naturally, Baltimore stalwart John Waters gives voice to the gruesome — but winsome! — images.